This fun twist on the popular ad series features the unmistakable (if you're in the know) silhouette of a bird call. 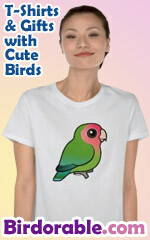 This fun birding design makes a great gift for pishers. iPish in orange.